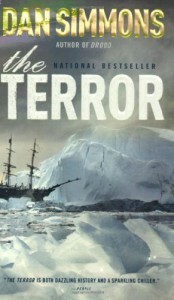 According to the blurbs on the back cover, The Terror is a "bone- and spine-chilling," "mesmerizing thriller." Meh, I've got scarier things hiding under my bed. 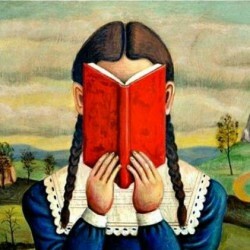 However, as a work of historical fiction it's top-notch. I wish Dan Simmons had focused all of his efforts into making The Terror strictly an historical novel instead of haphazardly switching between history and horror. In my opinion, the real threats that the crew of the two trapped ships face over the course of three years are far more terrifying mightmarish than 'the thing' from the ice that continuously stalks and preys upon the crew. The desolate landscape, frigid Arctic temperatures, perpetual darkness, lightning storms, blizzards, dwindling coal supplies, tainted food rations, scurvy, imminent starvation, thoughts of cannibalism, threats of mutiny...that's the stuff real nightmares are made of. I found myself completely engrossed during these parts of the novel and only skimming over the superfluous 'unknown monster from the ice' parts. Overall, I enjoyed The Terror, but the book's lack of focus and resulting identity crisis forces me to give it only three stars instead of four.